We have dreamt of visiting the magic world of caravans of the Great Silk Road since childhood. Here, in this world we can see charming east beauties, banquets with tasty dishes and fulfillment of wishes. Art-café “Uchkuduk” is fairy tale in reality. Two floors are at your service. There is a big banquet room with three legendary wells on the ground floor. The VIP cabins are on the first floor. The halls are decorated in accordance to Uzbek traditions. “Fergana” hall is decorated with pictures of the famous “Farhad and Shirin”, “Bukhara” hall is the summer residence of Said Olim Khan, “Nukus” hall is decorated as a jurt, the gates of dazzling Ak-Sarai are alwaus opened in “Shakhrisabz” hall. “Uch-Kuduk” is the guide not only in the history, but also the guide into the world of cuisine. You can come here to have a dinner and also you can have a rest and tasty supper after your working day. 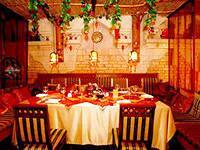 Friendly staff, the hospitality, as well as the magical flavor of the Uzbek and European cuisine are waiting for you! Address: Tashkent, Shayhantaur Street, mosque "Kukcha"